To create a best-of-both-worlds hybrid between the almost-perfect theatrical cut and the intriguing director’s cut. - The scene with the Ceti eels is uncut. - Used the first half of the director’s cut engine room conversation between Kirk and Midshipman Preston in the Enterprise engine room, in which Scotty reveals that Preston is his nephew. As I read the book before seeing the film, I always felt Scotty’s extreme emotional distress at Preston’s death lacked sufficient explanation; and while the dialogue in this scene is not the best scripted in the world, it is better than nothing. The second half of the scene is the theatrical take with the close up of the cadets and the better line delivery at the end. - The longer version of the scene in which Chekov informs Dr. Marcus that Reliant has new orders is retained with its more logical expanded dialogue. - The theatrical take of the Regula One scientists arguing about Starfleet’s “new orders” arrival has been used. This version creates more suspense, and we uncover the fate of the scientists as the Enterprise crew do. - Included the theatrical version of Spock and McCoy’s argument about Genesis, as the director’s cut additions were unnecessary and dampened the fiery intensity of the exchange. Moreover, the line delivery was not as good as it could have been. - The scene in which Midshipman Preston dies in sickbay has been recut to omit the director’s cut expanded dialogue and follow the theatrical version, which flowed better with the rest of the film; however, Preston still dies in a close-up shot like the director’s cut. - Removed the scene in which Kirk informs Spock that David is his son, so that the music does not loop here. This short scene was uninspiring in its implementation, broke the flow of the sequence in which it was included, and we know enough of Kirk’s close friendship with Spock to surmise that he informed him at some point. - For the same reason, I removed Saavik’s question on the bridge and Spock’s response about the human ego. Again, the music no longer loops here. This review is based on my opinions and my viewing experience. Nothing is meant as an attack. Spoiler warning. Audio: sounded great on my 2.0 system. Absolutely no complaints. Video: Looks the same as my 2disc dvd, again no complaints. EDITING: Everything was executed perfectly, nothing was distracting, perfect! *I love the expanded KIRK’S glasses sequence, glad you kept it. *Uncut Ceit eel, Right on. *The engine room scene is perfect this way! *Keeping the long version of CHEKOV/CARROLL, good choice. *Theatrical version of the scientists arguing, good choice. *Theatrical version of SPOCK/McCOY argument, again good choice. *I wish you kept the scene of KIRK informing SPOCK about DAVID being KIRK’S son and just used a different que. *Again I wish you kept the scene of SPOCK telling SAAVIK about the human ego and used a different que. 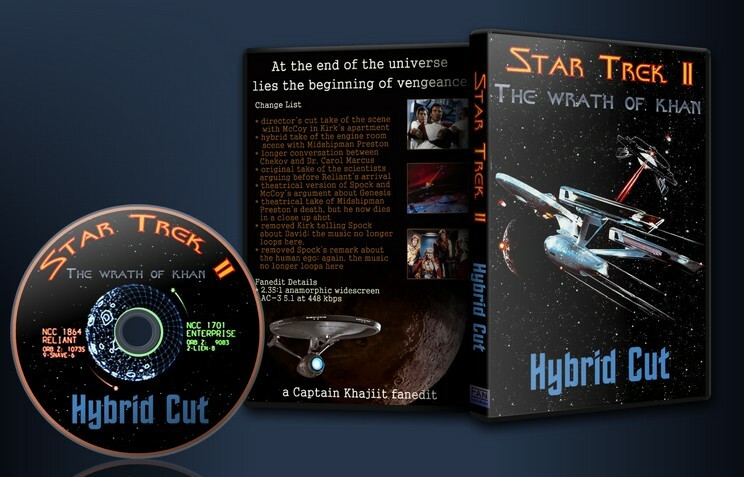 SIDE NOTES: This is THE go to version of The Wrath Of Khan. if you can’t decide on the theatrical cut or the directors cut, then watch this version, you will not regret it.